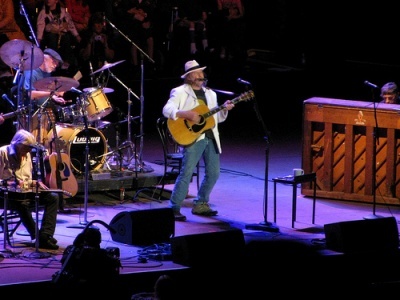 Photo Gallery of Bridge School Benefit 2009 by RockOnCali. Win Neil Young Archives box set. Details on Berkeley Place » THE GREAT NEIL YOUNG GIVEAWAY. With an anti-endorsement like that, who could blame fans for being drawn to the album like cellphone camera-wielding travelers to a freeway wreck?" From Modular People: "Wolfmother have been included on the War Child: 10 compilation, covering Neil Young's After The Gold Rush classic, 'Don't Let It Bring You Down'. Joining the track list ranks with Wolfmother are big guns such as Radiohead, New Order and Beck just to name a few." From Purple Words on a Grey Background a video interview with Jim Jarmusch on Neil Young and Year of the Horse (@ 4:30). From Leigh: "On the Greendale feature film, if you go to 'more' and go onto the 'family tree' and click on 'edith' it says that she made a record and then on the bottom of the third page, it says play record. you hear 'don't fence me in' by edith. presumably this is actually Pegi with possibly Neil on guitar. any one else discovered this?" "In one way, I like to think of Kathleen Edwards as the female Neil Young. OK, Edwards is prettier, younger, slimmer, and to my knowledge has only ever recorded one guitar solo of her own, while her male compatriot is of course famed for his massively extended live ones. But they share much commonality of spirit. It is her view of the human condition, and how she expresses it lyrically and in music, that puts Kathleen Edwards right up there." NNC: From Colin Horgan - Yesterday\'s Weirdness – The ’00s: How ‘Idioteque’ explains a decade - True/Slant: "The blogosphere and social media furthered our alternate selves, projecting a persona that exists in a meta-reality, both everywhere and nowhere simultaneously." Thanks Femmebot! Keep on tweetin' in the free world. Random comment from random blog: Neil's Journal to be published? I was looking at Borders.com and came across something called The Neil Young Journal 1942-1972 due out June 1st 2010 from Simon and Schuster. Is Neil publishing a book? THis is the first I heard of it. Can anyone confirm this? How exciting! Neil's Journals? Neil Young is a Canadian singer-songwriter, musician and film director. He was inducted into the Rock and Roll Hall of Fame as a solo artist in 1995 and also as a member of Buffalo Springfield in 1997. The co-founder of Farm Aid, Young is an outspoken advocate for environmental issues and is currently working on a documentary about electric car technology. Pegi Young was expected to release ‘Foul Deeds’, her second album this year, but something went astray. A note at her website states, “due to circumstances beyond my control, my CD and live shows have been postponed until further notice”. She wil play SXSW next year. Any Howard Stern fans out there? If you listen to him you know he's a huge Neil Young fan. Howard mentions Neil at least twice a week. He mentioned the Archives when they came out (he bought a copy for his daughter) and always sings Neil's praises. Today as a bumper he played My, My Hey, Hey, after commercials and he mentioned that it really bothers him that Neil has never done his show, after all these years of talking Neil up, etc. He said Neil needs to "just get in there", talk for a few minutes and play a tune. SO who thinks Neil Young would ever do the Howard Stern show? I totally think he should. It would be friggin awesome... but would he? Love Howard Stern or hate him, he's a great interviewer and asks questions no one else would. Many of Neil's peers have done the show- Paul McCartney (twice), Stephen Stills, Elton John, Ringo, Bowie, Willie Nelson, James Taylor, Stevie Wonder to name a few. I think Neil and Pegi should go on to promote Pegi's new album and maybe Lincvolt and the Archives. Millions listen to Stern on Sirius every morning and still the show still proves to be a great promotion vehicle. I'm just a fan of both and think it would be the greatest thing. Neil do the Stern show! !